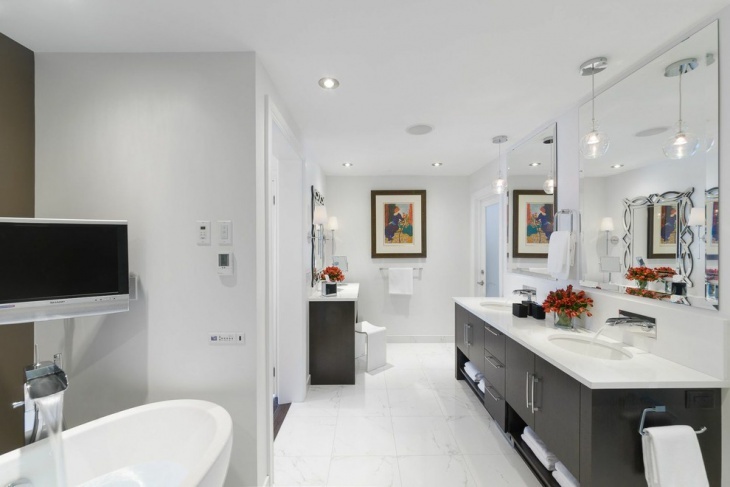 Having a properly designed bathroom that has modern looks along with the required facilities is essential. 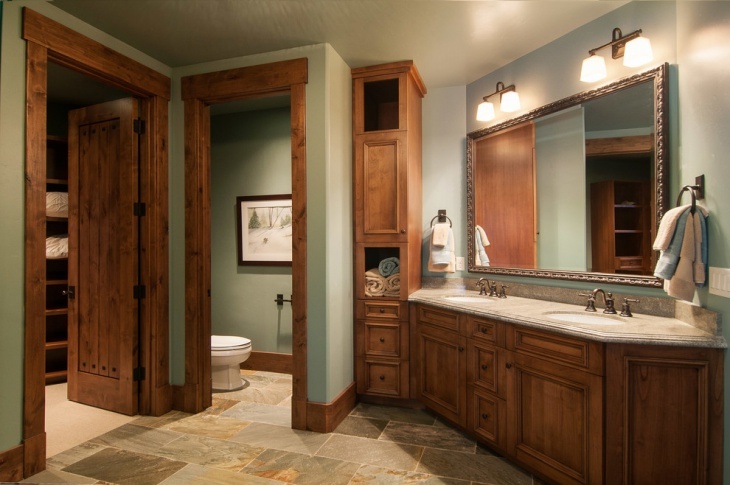 You can’t neglect bathrooms while just focusing on the rest of the house. 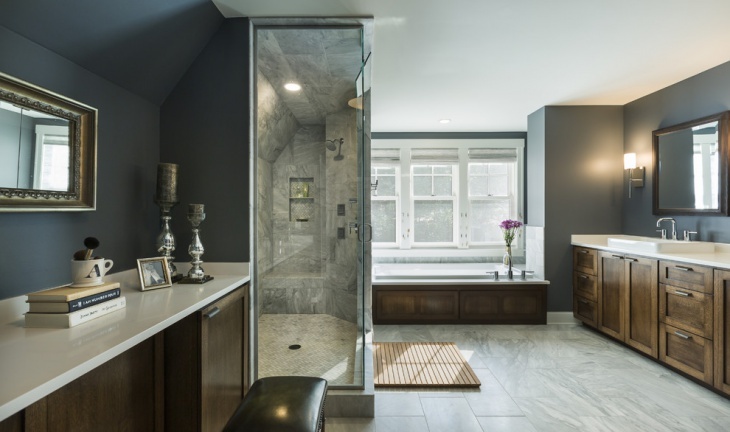 If you are looking for a dark-colored bathroom design and are confused regarding what design to choose from, this article might help you out in giving you a few tips. Grey is one of the most trending colors today for the purpose of interior deisging. 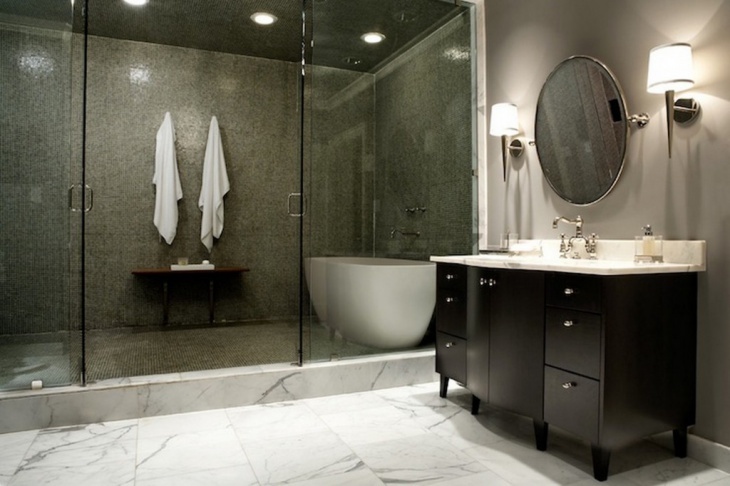 A combination of grey, white and black can give your bathroom a rich and sophisticated look. 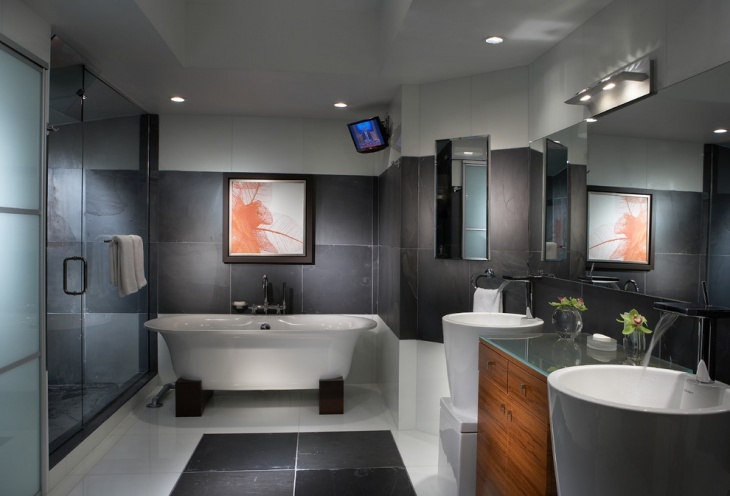 Black and grey combination in the bathrooms also looks very modern. 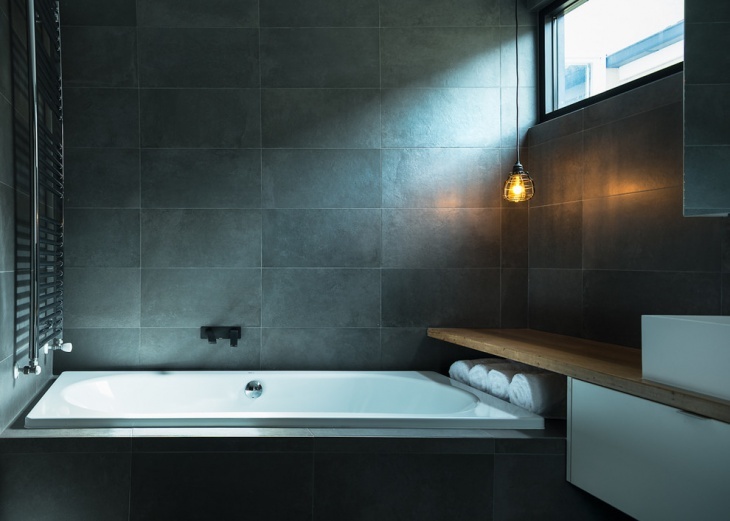 You can also set up textured tiles or mosaic tiles of a different hue of the same shade and it will change the look of your bathroom completely. If you have a spacious bathroom, you can think of setting up a dressing table along with a mirror and a chair to fill up the vacant spaces. You can also set up big rugs and a bathtub of any color of your choice. You choose from a variety of dark shades like brown, burgundy, magenta, etc, and combine them with alittle hint of white to have a new makeover for your bathroom. 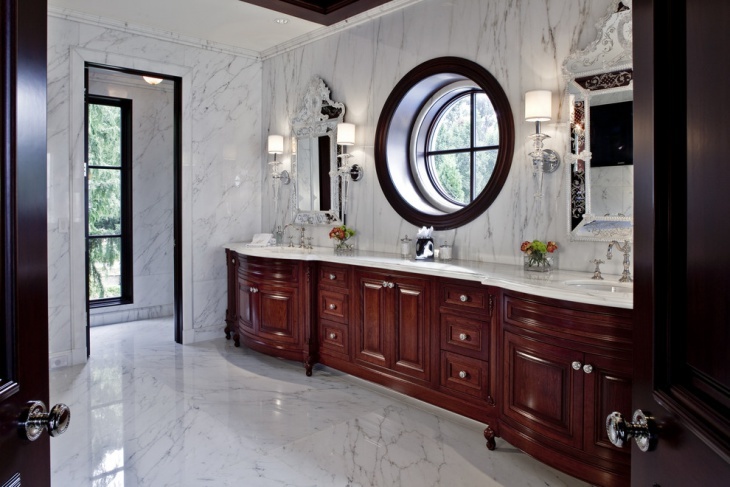 You can also include marble walls to give your bathroom a rich look. You can choose this design if you have a bigger bathroom. Choose white color for the walls and floor and a darker shade like brown, black or grey for the furniture like cabinets, wall pieces, vases, etc. 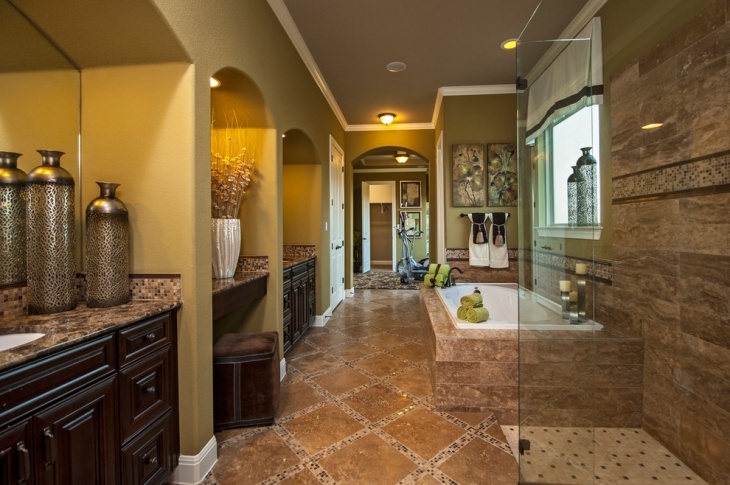 This will make your bathroom look stunning. 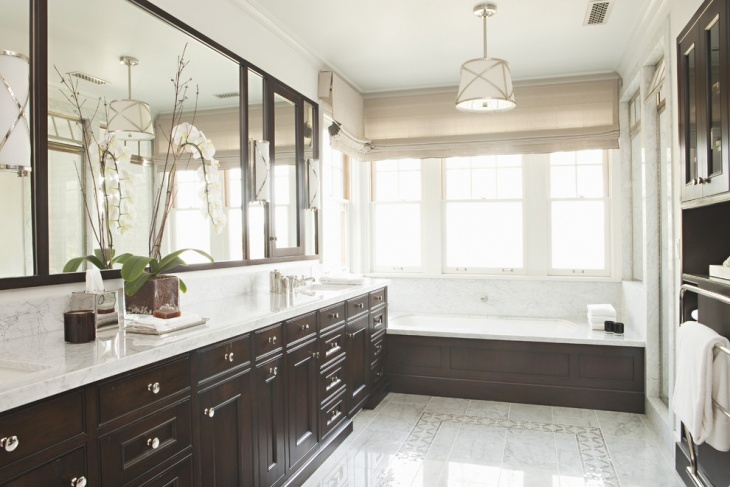 Add a touch of white and dark brown to your bathroom to give it a traditional look. 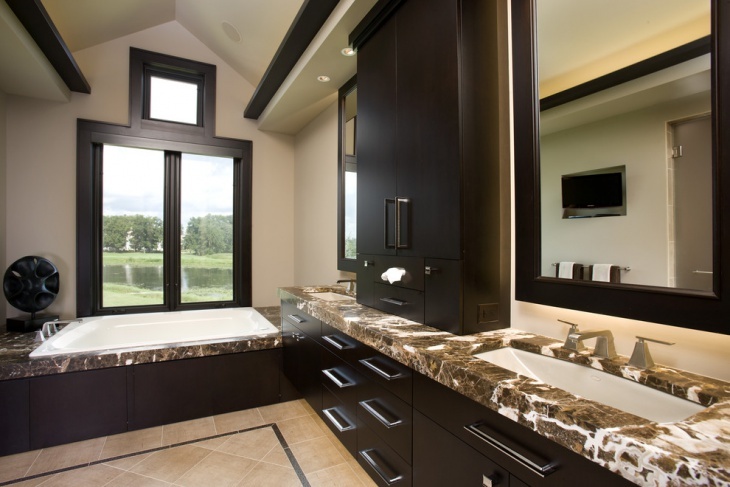 Select wooden cabinets and polishing and the rest of the bathroom as white to make it look beautiful. You can also add traditional wall pieces or paintings and flower vases if you wish to. This is one of the modern styles of the bathrooms that are found in royal hotels. 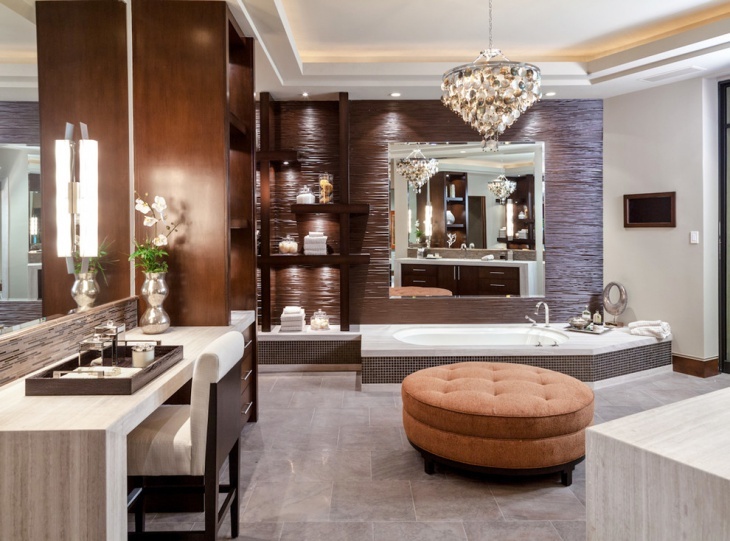 Just add a chandelier to the ceiling of your bathroom in a complimentary color with that of your bathroom and it will make your bathroom look modern and exquisite. 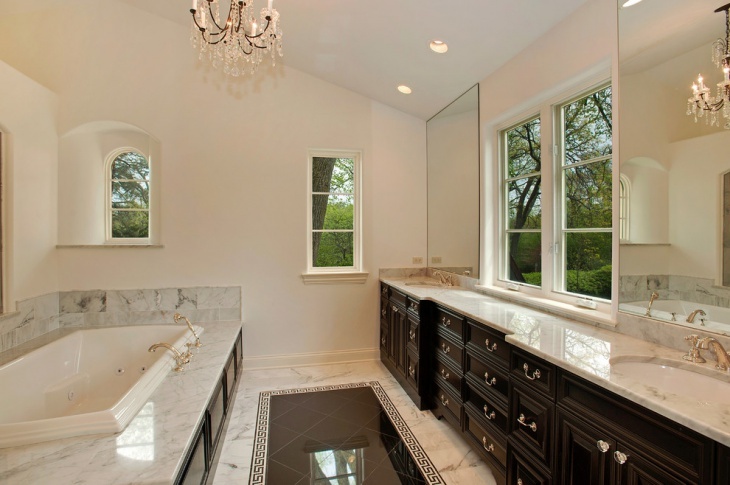 A dark colored bathroom with white marble floor is a very popular choice for bathroom design. Choose this design along with golden hangings and decorations and make your bathroom look royal. This design looks the best when the bathroom is spacious. 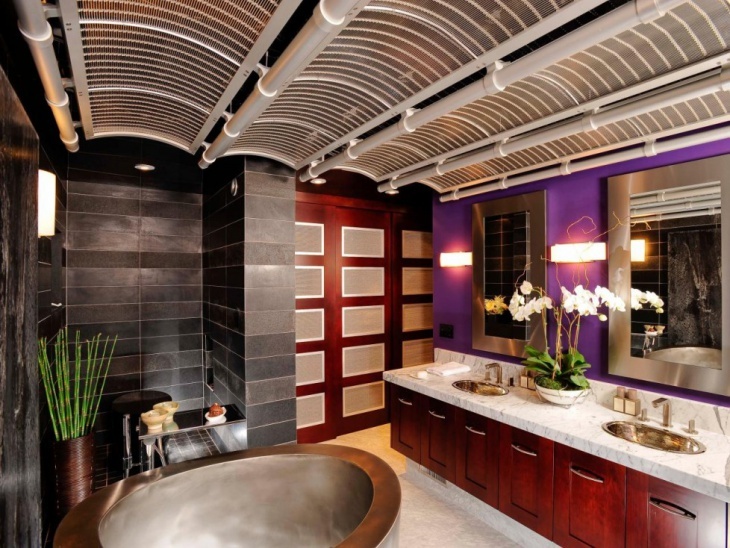 This too, is one of the traditional bathroom designs used by many people. Choose brown furniture and a more dark shaded flooring to give the traditional touch. You can add simple flooring or textured flooring, both will look great with the white colored countertops. 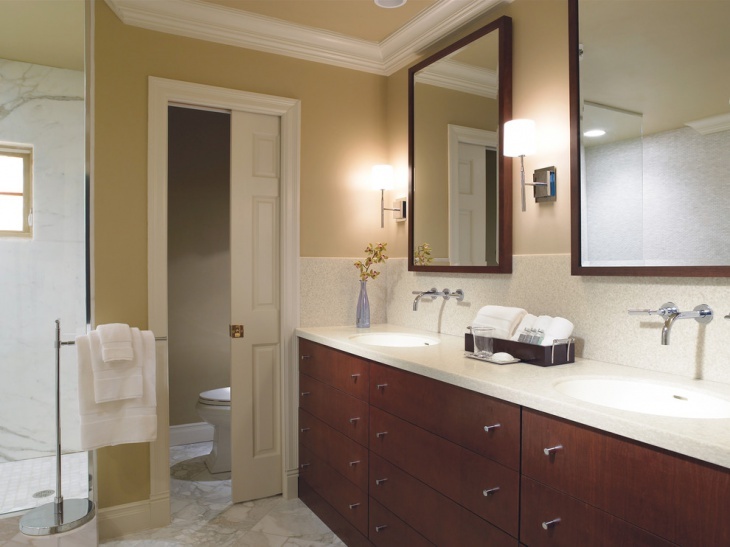 A combination of cream or off white with dark brown makes the bathroom looks rich and stylish. 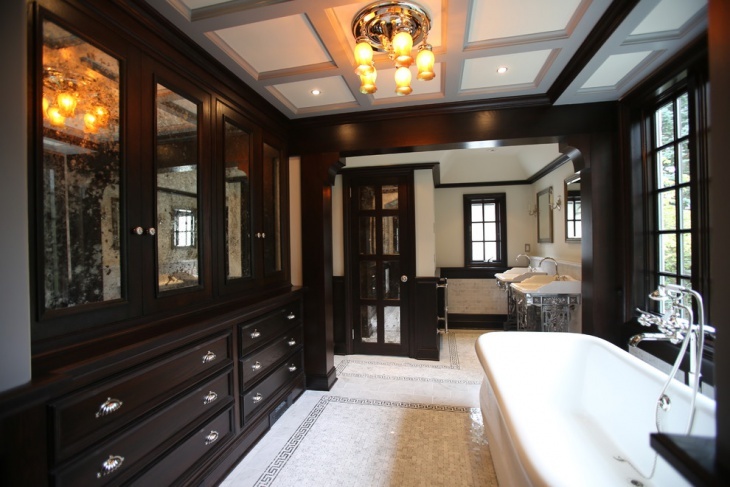 You can choose from chocolate brown, chestnut brown, etc and change the look of your bathroom. For the flooring, you can opt for mosaic tiles or tiles that have designs of the same colored hues as that of the bathroom.